Hello and welcome to a quick demo of Flexie CRM, the CRM built to help you automate your business, boost sales, increase the efficiency of your teams and manage your prospects and potential customers in the best of ways. As soon as I log in to Flexie CRM, I’m presented with the dashboard. They provide a complete picture of how are your sales team is doing, how your marketing team is doing, as well as other important metrics. You can easily create new dashboards, edit them or switch between multiple dashboards, and a lot more. The more your company grows, the more tasks your teams have to carry out. By going to Calendar, you can see all the tasks, notes and every other activity that might be scheduled for the day, week or month head. Your company may have different products and services to sell, each with different sales processes. How can you boost sales without losing momentum? In Flexie CRM, you can create deals, import/export them and much more. You can easily create custom stages for your deals, and move them by a simple drag & drop. Moreover, you can build multiple pipelines and easily switch between them. Your business is growing. You’re capturing more leads from your marketing campaigns, you’re converting them into contacts, your sales team is closing more deals and you have established solid relationships with other companies/organizations. What if you wanted to find specific leads/contacts/deals/accounts based on specific conditions? Well, that’s what Smart Lists are for. In Flexie CRM, you can build smart lists for every entity. By adding filters, you can make your lists even more specific. Smart lists are automatically updated every five minutes. Capturing leads from your marketing campaigns is a great thing. However, as the number of leads grows, you need to manage them effectively. How do you do that? In Flexie CRM, you can import/export leads, create new ones, share them with other people within your company, etc. Furthermore, you can use filters to find exactly what you want. Another great thing in Flexie CRM: you can take mass actions on your leads such as sending bulk emails, run mass updates, re-assign leads, etc. What you can do with leads in Flexie CRM, you can also do it with contacts, accounts, deals and other entities. Leads/deals/contacts and account management made simple. Used the right way, email can be a great tool to facilitate communication within the company, with potential and existing customers and so on. Having to switch between multiple email accounts is time-consuming and counter-productive. What if you could send and receive emails right from a single place? Well, Flexie CRM has turned this into a reality. Through the IMAP protocol, you can send and receive emails without ever leaving Flexie. Thanks to the full email integration, you no longer have to switch between one email account to another. All email correspondence will be in one single place, in your Flexie’s Mailbox. You can also send personal emails directly from a lead’s profile or from other entities, provided that they have an email field. Want to personalize your marketing campaigns even more? That’s where SMS messages come into play. In Flexie CRM, you can send text messages to lead or contact directly from the grid view (provided that they have a mobile field), or you can go to their profile. As your company grows, so does its need for a system that automates repetitive but important tasks. That’s where Flexie’s workflows comes into play. A workflow helps you automate tasks that would otherwise take a lot of time and resources. In Flexie CRM, you can build workflows on each entity(lead, contact, account, deal, etc). Do you have a lot of marketing emails to send, but don’t want to lose time doing it manually over and over again? 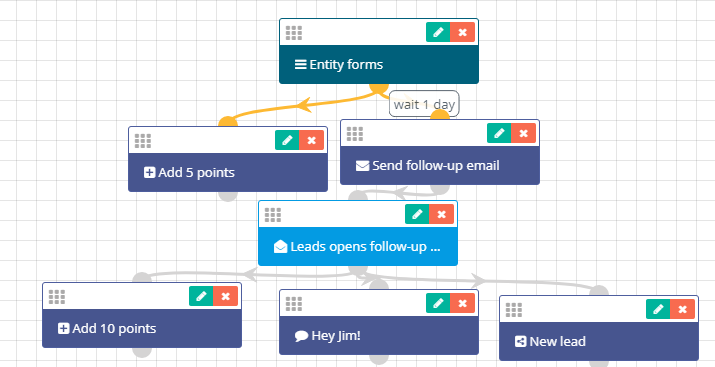 In Flexie, you can build a workflow through which you can automatically send emails to leads. You can easily automate marketing-related process, allowing your marketing team to focus on what really matters and what they do best: creating innovative marketing campaigns. Furthermore, you can execute action based on specific events or conditions. For example, you can automatically add points when a lead opens a marketing emails, send email/sms and web notifications, share entities with your marketing or sales team, add tasks, notes and a lot more. It doesn’t matter how complex you business scenario might be: with Flexie CRM, you can build workflows that handle all possible scenarios. Flexie is fully customizable, allowing you to create simple and complex workflows.